I received this book for free from the Author via The Romance Studio. This does not affect my views of the book or the content of my review. The major challenge I have with highland romance novels is the difficult dialect. As a result, I tend to avoid books in this genre. However, there are moments when one may find its way on my reading list. 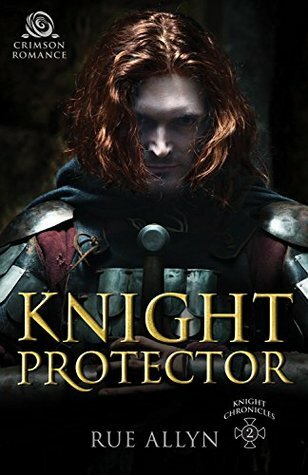 Knight Protector is one such novel. I must admit the author had lot to do it with being on my reading list. I have read a few books by Rue Allyn which I thoroughly enjoyed as such I expected no less from this title. Now that I am at the end I must say (unfamiliar dialect aside) this was an enjoyable read. Knight Protector is a story that’s filled with intrigue, suspense and mystery. It had me turning the pages as I was eager to discover who were the traitors. There were so many likely suspects, however it was not easy to figure out who were the culprits. I found the characters captivating. I enjoyed every moment spent in their world. I liked the way the author portrayed them. They were not perfect. They faced challenges and had their demons to conquer. These traits made them realistic and easy to relate to. Sir Colin Marr is the type of man who would sacrifice all for his country. He is protective by nature. It’s this protective nature that made him determined to protect Sorcha even though he knew she did not trust him. Lady Sorcha Marr is argumentative and may come off as annoying at times. However, behind that annoying streak lies an intuitive female. I thought the romance was well developed. Colin’s love for Sorcha had grown overtime. He loved her most of his life but circumstances led to him keeping his feelings under wraps. It was these circumstances that led to him making the decision to leave home. Ten years later he has returned, only to discover that his love for Sorcha still burned bright. It was entertaining watching them both trying to fight their attraction to each other. This was no easy feat in light of the fact that they were working so together to protect Scotland. I found the story engaging from the first page and had difficulty putting it down. As stated earlier this was a page turner. The pacing was just right. The romance and suspense elements of the story were well balanced. The story was so enjoyable that I was able to overlook the dialect, however I had an issue with how the story was wrapped up. It would have been good to see the reaction of the people Strathnaver when the real traitor was revealed. In addition, it would have been good to also to get their reaction when they realised that Sorcha was not their enemy and that she was just a victim of their former earl’s greed. It should be noted that this is the second book in the Knight Chronicles series, however it can be read as a stand-alone. I did not read the first book therefore I need to correct that error as soon as possible. Blackmailed into marrying her family's enemy, then swiftly widowed by illness, Lady Sorcha Marr must take charge of a clan she hates as much as they hate her. But fate intervenes in the form of her husband's twin - the man who betrayed her and led to her downfall. Has fate set them up to even an old score, or is it giving them a new shot at learning to trust . . . and love?